Click here to view Assessing & Tax Information ONLINE! Nelson Township, named for lumber magnate Herbert W. Nelson, is located on the northern border of Kent County, Michigan, north and east of the City of Cedar Springs. It is now primarily a rural residential and agricultural area with a population of 4,764 people as of the Census of 2010. 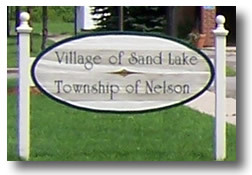 Its one community is the Village of Sand Lake where the township hall is located. The White Pine Trail runs the entire length of the township following Northland Drive and the rail bed of the former Grand Rapids and Indiana Railroad line. Gordon Park, the first county park in Kent County, is located on Northland Drive just south of the Village of Sand Lake. The Nelson Township/Village of Sand Lake Library is in their new facility located at 88 Eighth Street, on the corner of Lake Street and 8th. The large red building was designed in the agrarian style by Andrus Architecture of Rockford and constructed by Beckering Advisors Inc. of Grand Rapids. The dedication and grand opening was held Saturday, May 19, 2007. The facility was built, financed and will be maintained by Nelson Township. The library collection, technology, staff and their support is provided and operated by Kent District Library. Nelson Township is an equal opportunity provider and employer.